I flew into Austin in 1991 for a musical vacation and spent the rest of the decade there getting a doctorate at UT-Austin in American Studies. The city was strange, compelling, and still a bit under-developed: the recession of the late ‘80s hit the oil and gas industries hard and left a spectral downtown reminiscent of deindustrialized rust-belt cities. My first night, Jerry Jeff Walker played a sold out show at La Zona Rosa (before its outdoor stage) and I listened outside through an open window with two women who shared their wine and gave me a rundown of the clubs and taco houses. A few blocks east of my motel, I feasted on cheap, fresh tamales from an unmarked Mexican grocery. Austin was then a hip meme if you’d heard of it and if you hadn’t, it was just Texas. For residents of a city with a healthy economy and a rich cultural ferment, non-native Austinites have always been oddly insecure. Austin has a young, educated population working in social media, software, semiconductors, and biotechnology and vibrant relationships between university and corporate research. In New Orleans, where I live now, there is no economy except tourism (mostly) through food and music. It’s all we have so branding is important. Austinites can simply enjoy their lives in the major liberal zone of Texas. So why this neurotic need to feel you’re hip just to live there? It’s all Whole Foods’ fault, really. In 1992, Whole Foods was a rare hybrid of post-hippie culture on Lamar and 10th: it was part food co-op and part neighborhood grocery, with an in-house natural-foods café and a relaxed vibe of low-level exuberance. Its objective was affordable healthy food for an organic local community. When its first HQ opened on 6th and Lamar in 1995, it foreshadowed the hollow modernity of the globalized Austin dream. I saw four-foot spiraling mounds of organic carrots at two bucks a pound, beautiful expensive slabs of fresh salmon, overpriced merch at every counter. It was a big-box store of pretty food attached to an abstract idea of community. The Yuppies had consumed the hippies yet kept their self-righteousness about improving the world with Fair Trade coffee or whatever. I liked eating there, sure, since WF was like The Borg: resistance was futile. Yet I found H-E-B’s Central Market to be less expensive, less manipulative, and less flattering to one’s ego. Whole Foods was now less about eating healthy than about being seen while eating healthy. It was high-class hipsterism (and hucksterism). 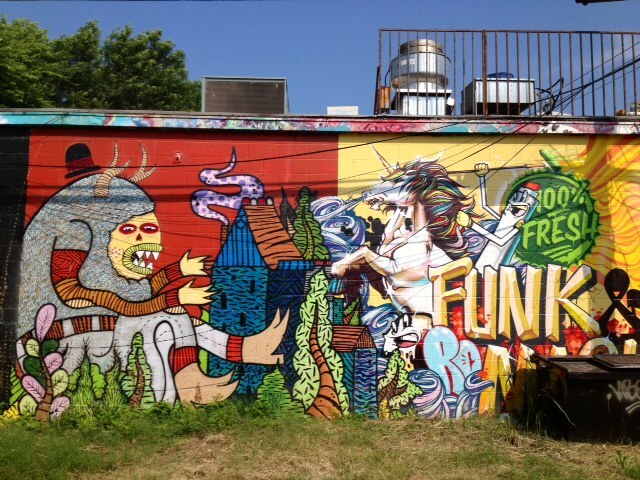 Once a city proclaims something like “Keep Austin Weird,” it is evidence of a unique cultural mix that has long since devolved into tourist rhetoric and cultural capital. New Orleans is often actually weird (as a set of experiences) but only newbies wear t-shirts like “Defend New Orleans.” If Austin wants to create a new kind of hipness — and separate itself from sisterly cities like Portland or Asheville (NC) — it should work to become a herald of borderland democracy, the heartland of a new multi-ethnic country. If I were you, Austin, I’d dig into your local traditions and settle into being good hosts: barbecue and breakfast tacos, Texas blues and Tejano, Barton Springs and serious boots. That way, visitors can make up their own minds and enjoy the city by example. In other words: be cool, don’t sell yourself as cool. Joel Dinerstein is Director of the New Orleans Center for the Gulf South at Tulane University, where he directs the American Studies program. He is the author of Swinging the Machine: Modernity, Technology, and African-American Culture Between the World Wars (2003), an award-winning cultural study of jazz and industrialization. He is currently working on a cultural history of the concept of cool through two different projects: first, as co-curator of a photography and American Studies exhibit at the National Portrait Gallery of the Smithsonian Institution entitled American Cool (opening February 2014) and second, as author of the forthcoming book, The Origins of Cool in Postwar America (University of Chicago Press). I was rolling right along with your assessment of the evolution of the city, especially the Whole Foods phenomenon as the epicenter of co-opted hipness. But then you closed your comments with the usual myopic view of Austin culture: barbecue, tacos, blues, Tejano, and boots -tourist trap descriptions of what’s cool about the city. There’s a difference between local culture and commodified tourism. That line is often slippery but I believe in both “local knowledge” and the distinctive organic aspects of a place. Any Austin citizen should know the difference between Curra’s and tourist-trap Tex-Mex, or how to find Tejano or blues without going to Antone’s. Curra’s is kind of a tourist trap. I get so damned tired of hearing outsiders tell however many of us natives are actually left how we should “sell” ourselves. To hell with selling anything, it’s all sold out from under us anyway. I myself miss the days when lawyers were the dominant clade of fauna around here, rather than real estate agents. Their cynicism, at least, was tempered with a sprinkling of culture. This entry was posted on May 18, 2013 by The End of Austin in Built Environment, Growth, Nostalgia, Race and tagged blues, cool, Frost Building, hip, Issue 3, Jerry Jeff Walker, La Zona Rasa, New Orleans, tacos, Whole Foods.